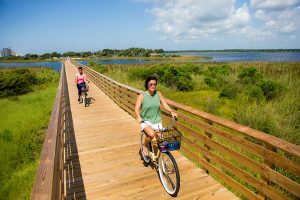 Endless activities can be found within the 6,500 acres of nature at Gulf State Park. The park includes first-class amenities, accommodations and events to be enjoyed by families visiting the Gulf Coast. Several accommodation options are available at Gulf State Park. Bring your camper or RV to one of the 496 full-hookup campsites. The campground features 11 air-conditioned bathhouses, laundromat, pool with a splashpad, tennis and pickleball courts, nature center and more. You may instead stay in one of 20 modern cabins and cottages. These structures are all within walking distance of the beaches. The newest accommodation option here is The Lodge. This beachfront accommodation includes 350 rooms, dining venues, a coffee and wine bar, and impressive amenities. Bike, run, walk and observe nature along the Hugh S. Branyon Backcountry Trail. Benches are placed throughout this paved trail so your feet can take a break while you soak up the sights, sounds and scents of nature. Another way to explore the trail is by taking a guided golf cart or Segway tour. For a small fee, guests will be led through the trail as a guide shares interesting information about each of the habitats. 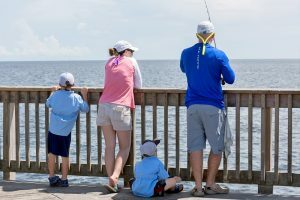 The activities calendar at Gulf State Park stays packed with fun events for guests and the public. Throughout the week, the park offers guided tours of the pier, movies, nature encounters, arts and crafts, open mic nights and more. Whether you’re seeking family fun, a relaxing escape or an action-packed adventure, Gulf State Park is a great option.